Posted on Fri, Mar 16, 2012 : 12:22 p.m. The tornado that struck Dexter on Thursday caused significant damage to the Hudson Mills Metropark golf course, officials said Friday. The golf course, which is closed indefinitely, is littered with debris from the storm, said Denise Semion, chief of communications for the park. This photo shows a tree that toppled onto the 13th tee box at the Hudson Mills Metropark golf course, which is closed indefinitely due to tornado damage. 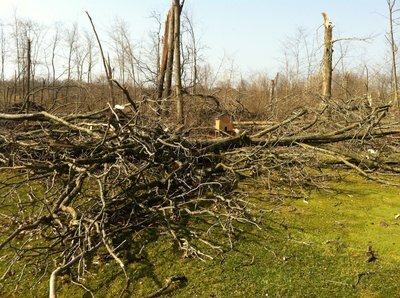 "One of the neighbors said he actually watched the tornado touch down on hole 9, which is by the clubhouse," Semion told AnnArbor.com. "It seems like the most significant damage was by holes 13 and 14. The trees are basically scattered every which way like someone came along with an egg beater." A photo posted to the park's Facebook page shows a massive tree that has fallen on the 13th tee box. Semion said the main park, which is located across the street from the golf course on North Territorial Road, is still open and did not have much damage. But the park does not have power, which means there's no electricity or running waters, so the bathrooms are closed. Remnants of the storm are visible throughout the golf course, including toys, a lawnmower, pieces of roofs and "somebody's high school papers," Semion said. In some parts of the course, branches are literally stuck in the sod, like a spear thrust into the ground. Semion said it was too early to tell when the golf course would be able to reopen or whether the parts of the course would need to be reconstructed. "The first thing we'll have to do, of course, is to clear the trees and look for those that are about to fall," Semion said. "There's a lot of clearing that we have to do." She added: "We're just grateful that no one got hurt." Contact AnnArbor.com's Nathan Bomey at (734) 623-2587 or nathanbomey@annarbor.com. You can also follow him on Twitter or subscribe to AnnArbor.com's newsletters. Sun, Mar 18, 2012 : 4:01 p.m.
Will this affect the construction of the Washtenaw Border-to-Border trail? It's supposed to follow the area between the golf course and the Huron River's West bank. Sat, Mar 17, 2012 : 2:18 p.m. Apparently, Mother nature has voiced her displeasure with golf courses! Sat, Mar 17, 2012 : 3:19 p.m.
At least someone will be home to clean out the garage this weekend. I too side with Mother Nature and golf courses. Sat, Mar 17, 2012 : 1:25 p.m. Considering there were people in the park at the time, it's amazing that no one was hurt. Fri, Mar 16, 2012 : 8:14 p.m. I wonder what this means for the slope rating in the future.